For an “absolutely wonderful” vacation in Pigeon Forge, try the 2-bedroom, 2-bath cabin Absolutely Wonderful! There’s a reason for the name, and you’ll discover it in this cabin’s cozy living spaces, long list of fun amenities, picturesque views, and semi-private atmosphere. Absolutely Wonderful, located less than 6 miles from downtown Pigeon Forge, provides distant views of the Smoky Mountains surrounded by old-growth trees. 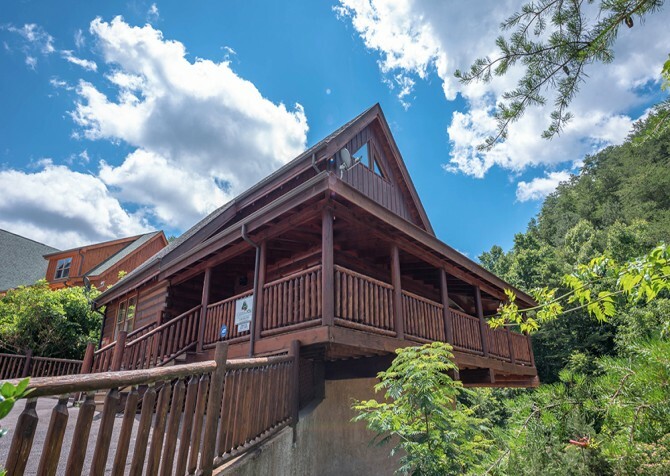 Positioned close to a gated community, this 8-person cabin offers privacy as you soak in these views from your covered, wraparound porch or your bubbly outdoor hot tub. Absolutely Wonderful is ideal for family vacations to Pigeon Forge. You can even bring the family dog to this pet-friendly cabin! 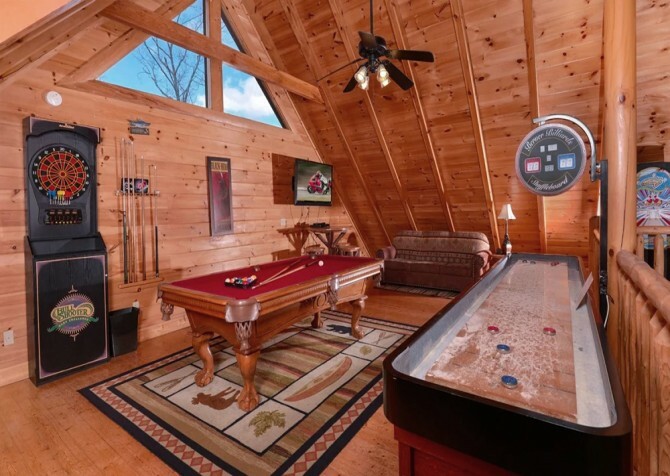 Enjoy a game room with multiple options for indoor fun and community indoor and outdoor pools just minutes from the cabin. For an ideal place to relax and enjoy a fun-filled getaway with your family or a small group of friends, book your next Pigeon Forge stay at Absolutely Wonderful! While there are tons of reasons to visit Pigeon Forge during your stay at Absolutely Wonderful—including a night out with the family to the ever-popular Dolly Parton's Stampede —you’ll appreciate having a comfortable place to relax at the end of long days downtown. 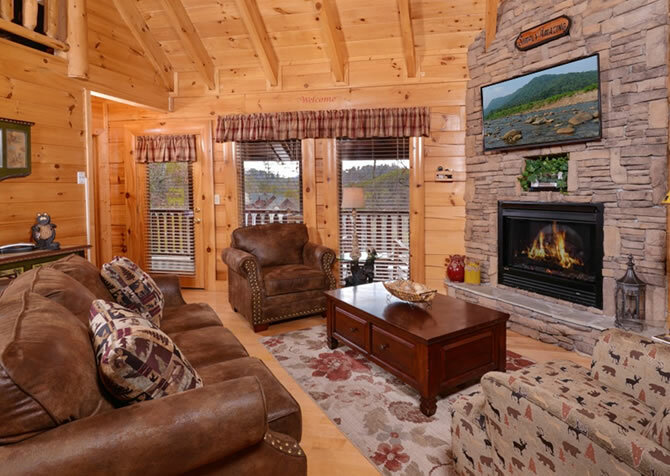 This cabin’s living room provides exactly what you’ll need with its large leather couch and two oversized chairs. You can sink into comfort inside Absolutely Wonderful before turning on your 55-inch smart HDTV for an evening of entertainment right at your fingertips. Watch a movie with the family using this cabin’s DVD or Blu-ray player, or just sit back and relax in front of the beautiful stone-set electric fireplace. The coffee table in the center of this room provides the perfect place for setting out board games, a delicious array of snacks, or one of our gift baskets for a special occasion. Ask our reservation specialists about adding a gift basket to your cabin reservation when you bring your family to the Smokies! Sometimes you don’t have time to get together as a family during the school year, so make your vacation to Absolutely Wonderful even more wonderful by enjoying homemade meals in the cabin. The full-size kitchen, with all your major appliances and plenty of unexpected extras, makes it easy to cook your family’s favorites. A pot of chili, oven-roasted turkey, or mama’s meatloaf are a few ideas for a homestyle dinner in the mountains. Of course, if you cook all the time and want a break, use your time in the Smokies to try delicious downtown restaurants. You can even pick up your food and take it back to the cabin—that way, you get to enjoy mountain views and family time while tasting the variety of flavors in the Smoky Mountains! Want to know some really great reasons to take advantage of your dining room instead of dining downtown? You’ll save on gas, money, and time! Besides what you save, you’ll gain quality time with the family that doesn’t always happen when you’re distracted by the sights and sounds of Pigeon Forge. So be sure to spend some time around the table inside Absolutely Wonderful. Your 6-piece dining set has nearly enough room for your 8-person party. There’s room on the couch as well in this open-concept cabin, and if it’s a nice day, try dinner on your covered porch at the picnic table around the back. If this kids need a separate place to hang out or you just want a quiet place to take a cat nap while the rest of your group watches TV downstairs, try the game room located in the loft of Absolutely Wonderful. This large space features plenty of indoor gaming options, including a full-size pool table, a multicade game table, and an air hockey table. But game time isn’t all this loft space is equipped for. There’s also a twin-size bed, a large couch, and a flatscreen TV mounted in the corner. You can use this as a quiet nook for reading a book, watching a movie, or catching some ZZZs during your Pigeon Forge getaway. 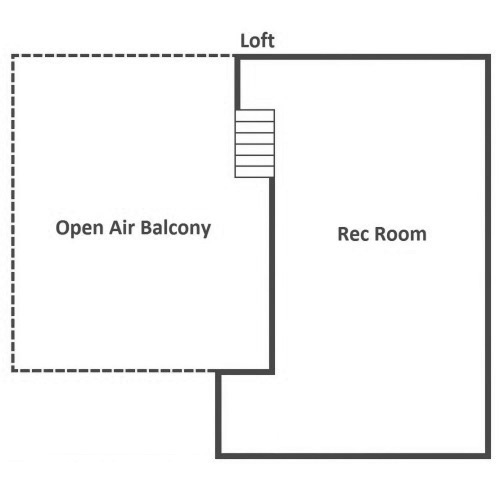 Plus, a new AC unit here - with a remote control - keeps the loft nice and cool on those warm summer days! There’s even a sitting area with two chairs and a small wooden table in between, so be sure to pack a deck of cards and your favorite board games! For more ideas on what to pack and other helpful tips, be sure to read our advice on traveling with a family to the Smokies. With its large living spaces and long list of amenities, Absolutely Wonderful is sure to become your family’s home away from home in Pigeon Forge. 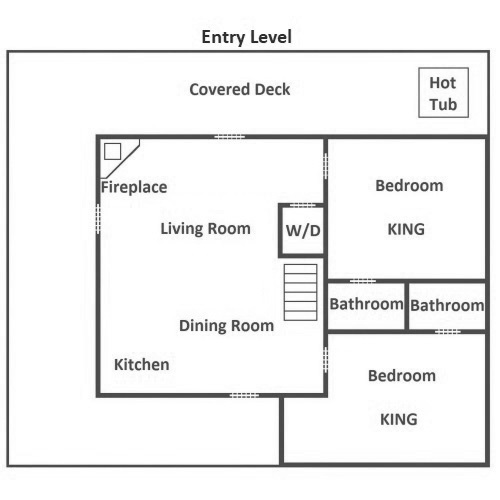 The spacious interior continues into the 2 bedrooms this 8-person cabin has to offer. The master suite inside this cabin features not only a king-size bed, but also a cozy sitting chair and an indoor jetted tub. Above the tub, enjoy a mounted flatscreen TV; beside the bed, you’ll find convenient extras like a nightstand with a reading lamp and auxiliary-compatible alarm clock. The second bedroom inside Absolutely Wonderful also features a king-size bed and its own flatscreen TV. And for extra sleeping space, enjoy 2 twin-size beds and 1 queen sleeper inside this cabin for 8. Summertime in the Smokies is definitely one of the most popular times for families to visit Pigeon Forge, but if you’re interested in booking Absolutely Wonderful for your stay, try a visit to the Smokies in other seasons as well. 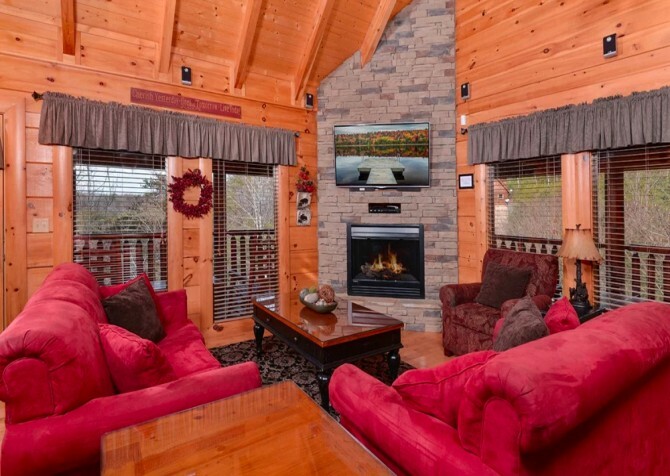 The fall will be the best time to enjoy the colorful leaves on the trees that surround this cabin, and the winter will allow you to see through the bare-limbed trees to the Smoky Mountains in the distance. Bottom line, no matter when you stay at Absolutely Wonderful, the outdoor spaces at this cabin will make your stay worthwhile! Enjoy a wraparound covered porch that’s large enough for your entire group. On the porch, you’ll find padded deck furniture that’s comfortable for sipping coffee in the mornings or glasses of wine in the evenings. Finally, enjoy a relaxing soak in your outdoor hot tub with a privacy wall. Your family will love spending time in the great outdoors at this versatile cabin! One of the many perks to staying at Absolutely Wonderful is the access it provides to community amenities through the Bear Creek Crossing Resort, like an outdoor pool for summer getaways and an indoor pool that can be enjoyed all year round. Along with the community amenities and cabin amenities already listed, Absolutely Wonderful provides a flat, paved driveway, a washer/dryer, and high speed wireless for your convenience. This pet-friendly cabin also provides little extras like a Bluetooth stereo, a gas grill on the porch, and 4 big screen TVs found throughout the cabin. Absolutely Wonderful has everything you need and then some for a fun, relaxing getaway to Pigeon Forge with the family! Known for having “the fastest go-karts in Pigeon Forge,” this Parkway attraction features plenty of ways to have fun. Check out indoor go karts, bumper cars, and their figure-8 slick track while you’re in town! For over two decades, the Country Tonite Theatre has been providing guests of Pigeon Forge with a high energy, country-themed show that includes singing, dancing, comedy, American patriotism, and more! Enjoy dinner and a show with the family at Pigeon Forge’s Murder Mystery Dinner Show. You’ll solve a crime while enjoying a 3-course meal at this family-friendly attraction!